DOHA, Jan 22 (APP):Describing the overseas Pakistanis as the country’s “heroes” due to their hard-work abroad for their families as well as for the country, Prime Minister Imran Khan Tuesday said his government would steer the country out of difficulties, ensure its economic uplift and bring in pride for the green passport. “Don’t worry! 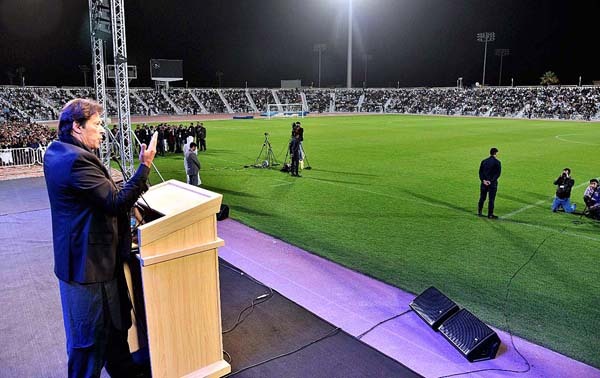 Your country will become a country where there will be respect for green passport,” the Prime Minister said while addressing a huge gathering of Pakistani community here at Al Wakara Stadium. Prime Minister Imran Khan, who was upbeat over the unprecedented gathering and welcome by the community at the stadium, said he was addressing such a huge a public gathering for the first time after his election rallies. He said always loved and respected the overseas Pakistanis, who worked hard even 18 hours a day for feeding their families at home and also contributing in the country’s development. “When I visited Italy, some young Pakistanis met me. They used to work 18 hours a day and six persons used to share a room to save money. The people, who are working, are considered very close to Allah Almighty,” he remarked. The Prime Minister, who was on a two-day visit of the State of Qatar, said he had better understanding about the Pakistani expatriates abroad as he himself went to the United Kingdom at the age of 18, where he studied and used to play cricket as well. He recalled how Pakistani workers at that time were ridiculed and even discriminated racially by some white people, but they used to tolerate and continued to work hard until they succeeded in securing high socio-economic status for them in the Western world. “Whenever I see overseas Pakistanis working hard abroad, I think that they are special ones, who always think and worry about Pakistan,” he remarked. The Prime Minister also lauded the overseas Pakistanis for always supporting him in his fund-raising campaigns for Shaukat Khanam Hospital, NAMAL University and Pakistan Tehreek-e-Insaf. “You are the people, who work hard and send money to your country. Our country is now being run on your remittances. You are heroes of Pakistan. There are also some villains, who steal the money from the country and launder abroad. My war is against those people,” he stressed. The Prime Minister said the devaluation of rupee was also due to money laundering as it caused short of dollars in the country that also created the balance of payment problem in Pakistan. Highlighting the economic problems of the country in cricket terms, Prime Minister Khan said when he came to power, there was a situation like he went to bat for Pakistan on 20 runs and four down. “But I know how to play in pressure,” he said and added that the partnership of Imran and Miandad had started and they would bring the country out of hard time. The Prime Minister said Qatar, which was bestowed with natural resources, also achieved the level of development due to good governance and effective economic management. “There are other countries like Nigeria and Congo which, despite having abundant natural resources, are poor,” he added. The Prime Minister said Pakistan, which was heading forward in economic terms 50 years back, was now behind the other regional countries due to mismanagement and bad governance. He said the Qatari businessmen, who met him during the visit, expressed their keenness to invest in Pakistan and also told him they were earlier shying away from investment due to corruption and heavy taxation in Pakistan. The present government had scaled down the number of taxes from 36 to 16 only and would further rationalize the tax regime, he added. About corruption, he said his was the first government that during its first five months no corruption scandal had emerged and he was confident that none would emerge during the rest of its tenure. He said Malaysia and Turkey were earning US $ 20 billion and US $ 40 billion per annum through beach and historical tourism, respectively. Pakistan with its beaches, highest mountain peaks, and historical and religious sites had a lot of tourism potential, he added. The Prime Minister was confident that Pakistan would earn huge amounts of foreign exchange from tourism and the country would not require financial assistance from any country. The Prime Minister thanked the Emir of Qatar for the warm welcome and the hospitality accorded to him and his delegation during the visit. Earlier, Foreign Shah Mehmood Qureshi, in his remarks, said the presence of such a large number of overseas Pakistanis in the stadium and welcoming Prime Minister Imran Khan reflected a “New Pakistan”. In the past, he said, the prime ministers of Pakistan used to address the Pakistani community in closed-door rooms abroad. “This is for the first time ever that a prime minister of Pakistan is addressing the community at a stadium,” the foreign minister added.